There are a couple of geese around here who appear to be sitting on these rocks, watching the world go by, every time I go past here. I wish I knew what the deal was with them, I have never seen geese hang around this country. Taken 4/25/2007. As my grandaughter would say, "That is a cool picture." 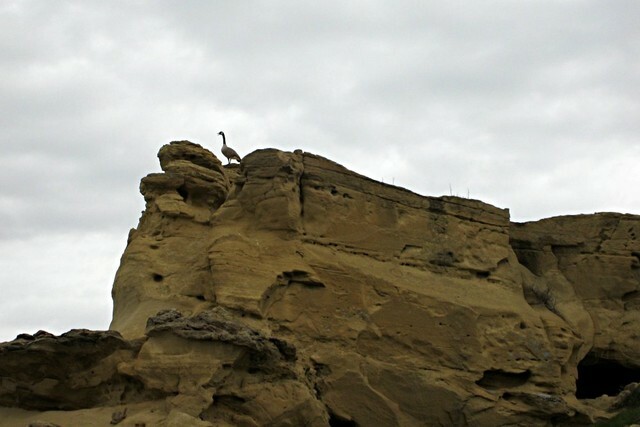 Anyone see the one eared cows head sand rock formation just below the goose? Lucky thought our recent snowfall around here was great stuff. Nothing better than to play in it according to him. I'm sure he was the only critter around here that liked it. Taken 3/31/2007.